Set the time:Pull the crown off the table and turn the crown clockwise until the exact time is reached. 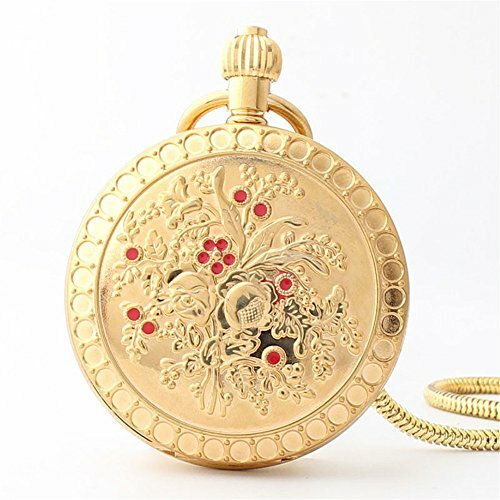 This classic round pocket watch with exquisite carving,which also can be a good present for your lover. Provide the perfect gift for your love and family or yourself,the best Valentine's Day gift,superb Christmas gift,birthday present, wedding gift and more. ★this is a favorite gift for your wedding day or Valentine's Day,a Christmas gift for your son or grandson,a birthday gift for Father's Day,a birthday gift for a friend,a graduation gift,suitable for Anyone's commemorative gift,even the perfect decoration of the room. ✔Service:If you have any problems,please contact us directly,we will try our best to provide you with satisfactory solutions. The diameter of the dial is 48mm,the thickness is 15mm,the length of chain is 355mm. This pocket watch is made of high quality copper with exquisite carving,which is durable and fashional. If you have any questions about this product by Zxcvlina, contact us by completing and submitting the form below. If you are looking for a specif part number, please include it with your message.